Premium Automotive Fire Extinguishers utilize a "Clean Agent." A "Clean Agent" is an electrically non-conducting liquid or gaseous fire extinguishing agent that does not leave a residue. Clean agents have long been the product of choice for protecting classic automobiles and racing cars - not to mention aircraft, computer rooms and other high tech equipment. The Halotron 1.4 lb. 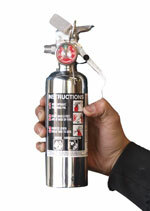 Chrome Fire Extinguisher is a clean agent extinguisher. 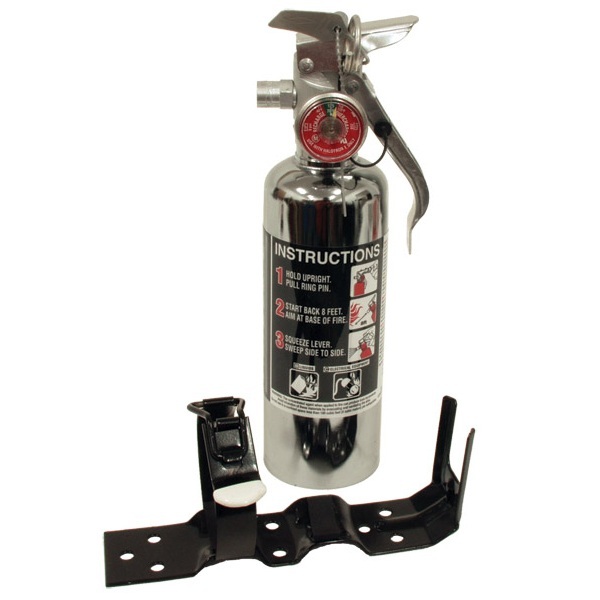 Combining the clean properties of HalGuard and a high gloss chrome finish, this fire extinguisher will dress up any car's interior and will become a show car favorite. Years ago I had just finished building a 74 Bronco, complete with all the California smog equipment. Little rubber hoses running everywhere. I took the rig for it's shake down run around town. It stalled at a light. It was on fire! I had no extinguisher. Someone finally put it out with a regular chemical agent extinguisher. Perfect size. Mounted to roll bar. Every Bronco should have one.